In My Kitchen...we had a party, my Dad's 60th party. After lots of planning and pinning and three days of cooking it all went well. As a result this IMK post has a bit of a party flavour, starting with my new lolly jars. I was happy to find cheap ($3) versions at my local discount store, that aren't so big you need bags and bags of lollies to fill them, but they still look good. I'm sure they'll get good use at the boy's next few parties. As I was picking the blue M&Ms out of the pack to get just the chocolate and white ones I felt like I was filling a back stage rider for Mariah Carey! In My Kitchen...I have my new icing tips. I've wanted to get better at decorating for a while and I've found the saying you 'need the right tools for the job' is true in this case. You can see in the picture that the new tips are double the size of the ones I've previously used and it makes icing so much easier and it looks so much better. I'm also more willing to make a big batch of icing these days which also makes it easier. In the past I couldn't always bring myself to use so much icing sugar, but now for a special occasion I'm all for it! I still need a lot of practise but at least I now feel like I am on the right track. I like the 1M and 2D tips the most. I got them as a set of four at Spotlight. They cost just over $5 each or you can get the set with disposable piping bags for $20. 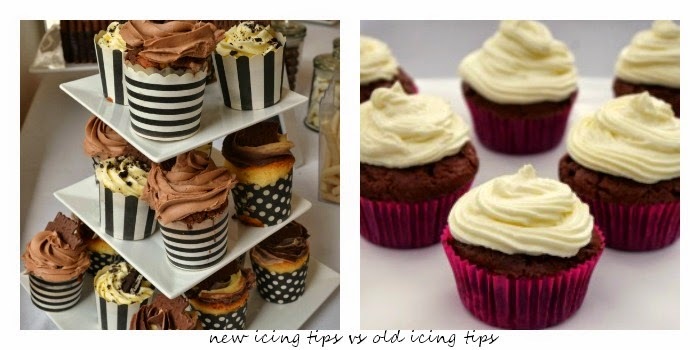 I like the new icing much better compared to what I put on my chocolate cupcakes with mascarpone icing. In My Kitchen...I have more cake decorations. Now I'm on a mission to get better at cake decorating I'll need more decorations, right? And better still, more occasions to make and eat cake! In My Kitchen...I will try to balance out all of the sugar and icing with this pumpernickle bread. I've recently lacked motivation to make anything interesting for lunch and so the old and boring sandwich has made a return. This may at least make an easy yet interesting alternative to using normal bread. I've never tried pumpernickle before but the package suggestion of eating it with smoked salmon and avocado looks like a pretty good place to start to me. In My Kitchen... I have 'exam survival kits'. My husband's Year 12 students finish in a couple of weeks and we stole this idea from my friends Facebook feed (thanks Sarah!). She was given a pack as a 'teacher survival pack' for report writing time and we have adapted it for exam time. Frogs for when you need to jump to it. Bananas for when you are going around the bend. Kit Kat for when you need a break. I think it's a great idea, I'll have to use it if I ever get back to teaching Year 12. And finally In My Kitchen...I have a foil thief. No cupboard or drawer is safe! I'm sharing this with Celia at Fig Jam and Lime Cordial - go over a check out what is happening in other kitchens all around the world. I am absolutely loving the exam survival kit!!!!! That is brilliant!!!!! And oh that icing just looks divine! Thanks Lucy. He gave the survival kits out today and the boys in the class ripped into them and started eating without even reading the note! Snap! I've been playing with new Wilton icing nozzles too! I wish I'd known about the ones at Spotlight though - that's a bargain! 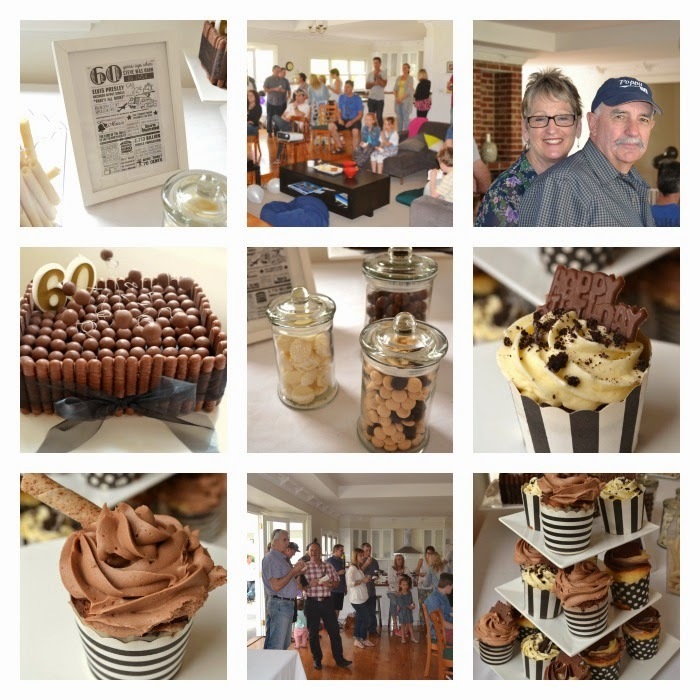 :) Happy birthday to your Dad, he's lucky to have you throwing such a great party for him! And I bet your hubby's Year 12 kids loved their treat! G'day! Your cupcakes made me smile today and thanks for this month's kitchen view also! that icing looks delicious and so well done. i am not very skilled in the way of cake decorating. i guess i had better try it another time. love the foil thief. so cute.